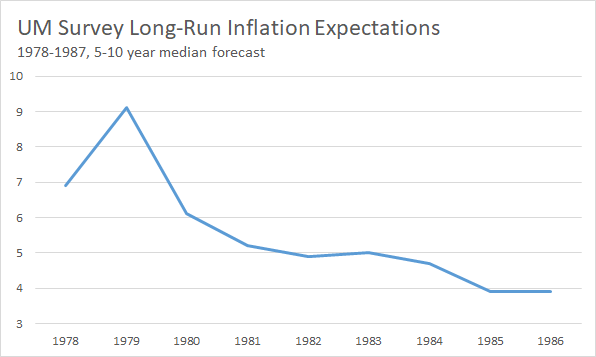 I have always thought the "market expectations" explanation of inflation a weak plank. Surely, the vast majority of businesses set prices in the present at what the market will bear. If five people knock on my door to rent an empty apartment within minutes of the Craigslist ad going up, I will charge what the market will bear. Likewise, if Cushing is glutted, oil prices will come down. If we assume competition, then prices are set by the market in the present, and anyone anticipating future deflation or inflation will get cut off at the pass. Then we have the problem of…who is paying attention to the central bank? What fraction of the population could pick Jerome Powell out of a NYC mug lineup? Of that group, how many know what is QE? And of that group, do they believe QE is effective or not? At this point, are we are down to a few thousand people in the US….they set the market? I never knew I was so powerful. Lastly, there is a bit of the tautology in the market expectations story. 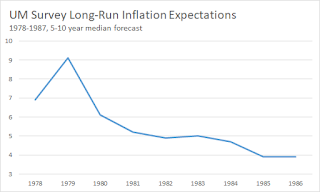 If inflation stays near 2%, we say the market expects the Fed to keep inflation near 2%. If inflation stays under 1% (as in Japan) we say the market is not confident in the BoJ. The BoJ has bought 45% of JGBs, keeps interest at zero on 10-year Treasuries, and pays negative interest on some reserves. Importantly, they have not gone to helicopter drops. Maybe that is the key. But if inflation should rise to 3% in Japan, then we would say the market thinks the BoJ has lost control. This strikes me as a very convenient way of thinking…but is it right? I guess if the market absolutely trusts the Fed, then it could print money with abandon, and the economy would boom---until businesses were rationing products and services by long lines or lotteries. 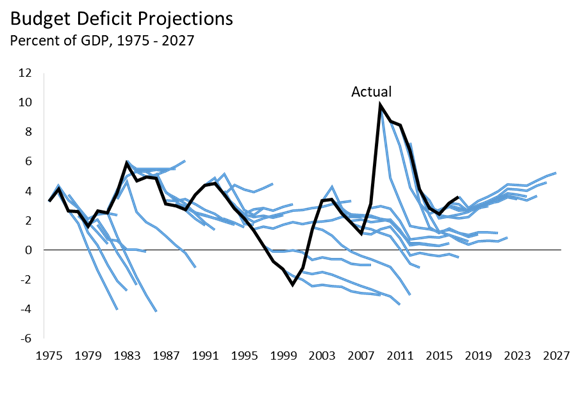 As for deficits, I do not know. Japan appears to be able to monetize its JGBs. I call it Mobius Strip economics. So who is the money owed to? The government of Japan owes the money to the government of Japan. And still they have near deflation. At worst I think the "market expectations" is merely a story line liked by some, another reason for long-faced central bankers to apply the monetary noose. I suspect orthodox macroeconomics is losing a grip on how the economy really works. Something does not add up. Either the government defaults on its debt, or the Fed "defaults" on its inflation target by printing enough to service and rollover the debt. Pick one. You are basically correct. The only twist is if treasury debt is de facto money (either directly, or monetized via banking sector). Then Fed printing is irrelevant (and inflation is not in control of Fed). Fiscal theory of price-level (which is distinct from Unpleasant Moneterist Arithmetic, because in former, debt is nominal) it is the price-level that adjusts to equilibrate demand for real money/bond holdings with nominal supply. So, in fact, I take back what I said earlier in agreeing with you -- it is not necessarily the case that the government must default if central bank does not "print money" (swap one type of nominal liability for another). The price level can just rise via a standard hot potato effect. How about the government buys the debt back...but there is not much inflation. The Japan model? See these Fed papers below that say QE is not inflationary, in part as it buys assets that back currency (the Dallas Fed paper). OK. So the Fed buys back debt and it is not inflationary there is a third option to inflation, or default. I'm not sure what motivated these comments. What are they in reference to? OK I read your Japan post, very thoughtful. I am only a wag, but as far back as 2008 I suggested money-financed tax cuts for the Social Security system. In other words, cut FICA taxes and print (digitize) the money to make up for revenue losses. This would have the extra advantage of lowering the cost of employment, increasing the rewards for working, and being a tax cut only on productive people and enterprises. My view now is, "Why keep your best player on the bench?" Money-financed FICA tax cuts should be the first fiscal-monetary tool applied early into a recession, or even as a prophylactic. Only convention, and perhaps a large dollop of establishment, crony capitalism, interest-group politics, and a shot of class bias stand in the way. Instead of money-financed FICA tax cuts, let's stuff the commercial banks full of interest-bearing reserves! "Either the government defaults on its debt, or the Fed "defaults" on its inflation target by printing enough to service and rollover the debt." As a practical matter, if not in theory, evidently there is a third option, and that is that a government can do some amount of QE and build the central bank balance sheet. It neither defaults on the national debt, not does QE seems to cause inflation. "remember how the Fed under Paul Volcker (Chair from 1979-87) slew the 1970s inflation dragon with its Draconian anti-inflation policy?" That's a blatant lie. Paul Volcker’s version of monetarism (along with credit controls: the Emergency Credit Controls program of March 14, 1980), was limited to Feb, Mar, & Apr of 1980. Even with the intro of the DIDMCA, total legal reserves increased at a 17% annual rate of change, & M1 exploded at a 20% annual rate (until 1980 years’-end). Why did Volcker fail? This was due to Volcker's operating procedure. Volcker targeted non-borrowed reserves when at times 10 percent of all reserves were borrowed (no change from what Paul Meek, FRB-NY assistant V.P. of OMOs and Treasury issues, described in his 3rd edition of “Open Market Operations” published in 1974.. One dollar of borrowed reserves provides the same legal-economic base for the expansion of money as one dollar of non-borrowed reserves. The fact that advances had to be repaid in 15 days was immaterial. A new advance could be obtained, or the borrowing bank replaced by other borrowing banks. It was before the discount rate was made a penalty rate in Jan 2003. And the fed funds "bracket racket" was simply widened, not eliminated. Monetarism actually has never been tried. Then came the "time bomb", the widespread introduction of ATS, NOW, & MMMF accounts at 1980 year end -- which vastly accelerated the transactions velocity of money (all the demand drafts drawn on these accounts cleared thru demand deposits (DDs) – except those drawn on Mutual Savings Banks (MSBs), interbank, & the U.S. government).This propelled nominal gNp to 19.2% in the 1st qtr 1981, the FFR to 22%, & AAA Corporates to 15.49%. By the first qtr of 1981, the damage had already been done. But Volcker errored again (supplied an excessive volume of legal reserves to the banking system), in late 1982-83. Nobody talks about the velocity of circulation. It's one of the most important determinants of economic growth. Nobody understands the mechanics of money velocity. Ignore income velocity, Vi, money velocity is a transactions concept, Vt. The transactions velocity, Vt, is an “independent” exogenous force acting on prices. Most of this “S-Curve” dynamic damage (sigmoid function), was done by the first half of 1981, with the widespread introduction of new negotiable demand drafts, e.g., the effervescent “saturation value” of ATS, NOW, and MMDA accounts. Thus, began secular strangulation (as predicted in 1961). The decline in money velocity is identifiable. It is particularly traceable to the decline in savings put back to work. This is due to the preponderance of bank-held savings, funds that are un-used and un-spent, lost to both consumption and investment. Why? Because from the standpoint of the entire economy, the DFIs always create new money whenever they lend/invest. They do not loan out existing deposits saved or otherwise. That is the error in Keynes' General Theory. In almost every instance in which Keynes wrote the term bank in the General Theory, it is necessary to substitute the term financial intermediary in order to make his statement correct. The upshot? Prepare for a depression.